My key takeaways? Flyers. Lots of flyers. Kidding. Dropped by the Franchise and Business Expo held last Oct 14 to 16 at the World Trade Center with the charitable Ilocana and couple of friends. Attended a similar one 3 years ago (has it been 3 years?!?). The event, just like the previous one, was organized by Association of Filipino Franchisers Inc (AFFI). 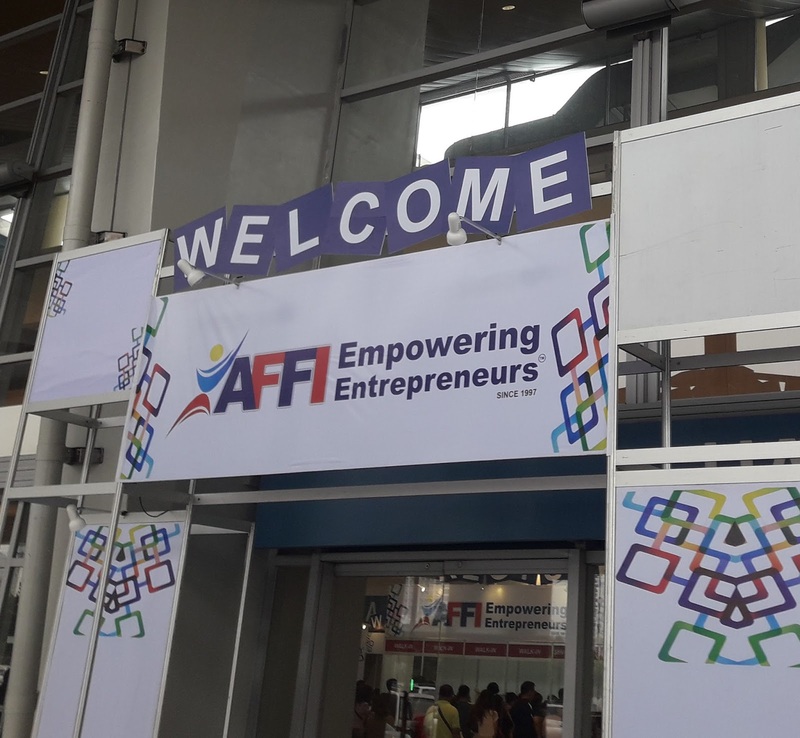 Despite the rainy weather, I would say the event was well attended, with many participating businesses open for franchising and many Pinoys wanting to have their own business, or just looking around, testing the waters. Many Filipinos want to be their own bosses. Filipinos are generally entrepreneurial. Here are some key takeaways and realizations. 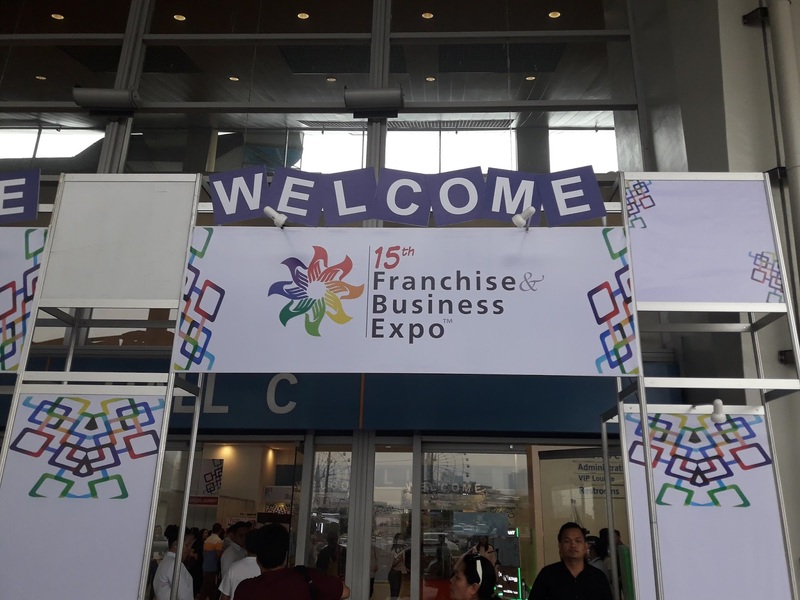 For every franchising booth we approached, the first question I always ask (aside from how much) is if they have ready locations for prospective franchisees. You see, selecting a business is difficult, but finding a suitable location for that business is equally difficult. This reminds me of the 3Ps and business tripod I previously shared about. There are many good business out there open for franchising but selecting a good location is challenging, daunting even. The usual response is that they provide location assistance, meaning franchisee will choose a location (preferably near your residence), and the franchisor will assess said location if it’s a good fit. Others offer location assistance for a fee, wherein Juan pays agents to look for good locations, subject to Juan’s approval. Maybe we should try this profession. I wonder how they locate good locations. But what I really wanted to know was if I don’t have a good location in mind, does the franchisor know of specific locations and places that are still available? Luckily, a few franchisors shared a ready list of malls that they find suitable and attractive for their franchisees to choose from, and that these locations are still open. Some also provide assistance in talking to the malls for vacant slots. Those with ready locations are usually the smaller start-up brands, or less known names with not much branches to begin with (hence the long list of potential locations). Otherwise, your preferred location might have multiple shawarma or siomai foodcarts already. In terms of franchise fees and initial investments, the set-up varies. Some offer a one time payment, some offer 3 year renewable contract, 5 years etc, so be sure to ask what is the coverage of the quoted franchising cost. We encountered a shawarma food cart offering PHP88K one time payment, comes with the booth and initial supplies. Let’s call it brand G. Why so low compared to other more established names? Precisely because brand G still has a small base, a not so known name compared to other shawarma foodcarts, so they are willing to sell their name and brand for a lower price. For now. Franchising for other shawarma food carts are at around PHP200 to PHP300K. Which begs the question, is it worth the initial capital? Is the brand you’re getting worth that upfront cost? For some maybe yes, especially established brands in established categories, like Potato Corner for example for fries. But for shawarma, are there known brands already worth the hundred thousand bucks? Or we can stick with brand G? Are we brand conscious when it comes to shawarma? You decide. How about siomai? Same thing. Some are cheaper, some more well known brands command higher franchise fees. Franchising means you get to use a known brand (technically), use their logos, the brand recall, their expertise and experience in running the business, their location assistance (they know a lot of leasing personnel in malls etc), their operational manuals and know-how of the industry, the market, the supply chain, suppliers, delivery processes, the secret winning recipes, etc. Basically their business is your business. They are meant to support you since you carry their brand. This is what you get assuming you’re willing to pay the hefty fee. They say this fee is your tuition fee so that failure is minimized. They’ve been there, they succeeded. Some prefer to start on their own. My charitable Ilocana wants to start on her own, likely a DIY laundry business or a tapsilog house. In fact all of these brands started on their own when they were still small. In starting on your own, you don’t have the brand and name recall yet, you create your own supply chain, from suppliers of raw materials, packaging etc, you create your own booth, find our own location, haggle for lease rates etc. Upfront cost is much lower for sure, but the chances of survival is slightly lower as well since your brand is still untested, unknown. But if you believe in your brand, I suggest you go for it. And if you think your market is not so brand conscious (like certain markets for salons, laundy shops, water refilling station), then go for it! 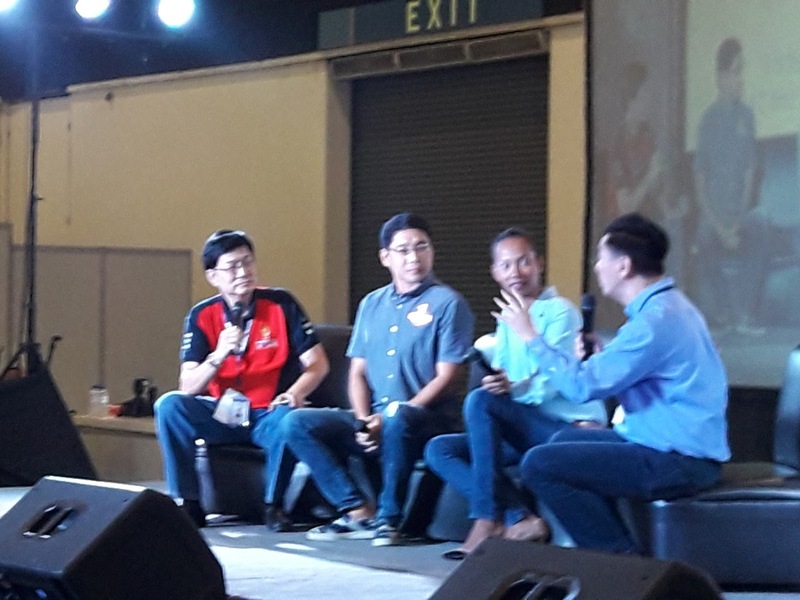 Got to hear part of Anthony “Tunying” Taberna and Wilma Doesnt’s talk and their main message was: you must love the business that you’ll go into. Passion. It will be difficult, and trying and tiring, but if you’re passionate about it, you’ll see to it that the business grows and succeeds. So which business is for you? Don’t ask me. Ask your heart. It is said that going rate for rental in SM Malls is PHP30K. For Shopwise in Cubao, PHP22K. Imagine that, your PHP300K can already pay for 10 months of SM rent, so if you can recreate buko or shawarma foodcart, might as well go for it than franchise right? The usual products: siomai, shawarma, buko, nachos, ice cream, sisig were there. Some new trends like lemon juice, kapeng barako frappe, soya and taho. Some big time restos were there too. Buko ni Juan has some locations in their list. Soya yummy (?) has lots of mall locations in their list because they have fewer franchisees so far, mostly high end malls are in their list. This is more a question of budget. Graco’s shawarma low franchise fee of 88k because they are not as known as other shawarma brands. Is the shawarma market brand conscious? There’s this tarp printer machine selling for PHP360K++ promo price also capable of printing transparent sticker and one view stickers (the one plastered in MRTs). Interesting. I like this business: Greenpak customized business packaging but very high minimum requirements (like 5,000pcs per size), not too friendly for small-time businesses and start-ups, especially if you have various packaging sizes. Might be good to come up with a different pricing strategy for smaller volume of orders. Another favorite: Plato Wraps. I like their food (very good!) and I don’t see much competition in their format, not much copycats if at all. My friends confidently said that they can recreate the sandwich recipe, but if they can, why aren’t we seeing copycats? Some provincial brands trying to conquer Manila. Province might be a good place to start given less competition? Franchise fees tend to go high because of the brand name and experience and contacts in various locations but building your brand and booth itself is less costly. Downside is experience, less know-how in daily operations, looking for suppliers etc. So many attendees. Many Pinoys want to have a business. How to capitalize on entrepreneurship frenzy? What are businesses serving businesses? This is my dream business. A business serving other businesses. Likely in packaging? Booth maker? Or perhaps consultancy? What’s in my heart? Get instant updates on entrepreneurship articles straight to your mailbox. Simply subscribe to us for free. Follow us on Facebook, Instagram and Twitter. Interested in stock market investing and affiliate marketing? Join me in Truly Rich Club. Lastly, feel free to support our cause by donating thru Paypal.